Coast Equipment & Services Company Bolted, Welded and Corrugated Silos, In-plant Bins and Accessories: Bolted silos are constructed of sidewall panels approximately 5 wide by 8 wide. These staves are precision cut, formed and factory-coated. They are versatile enough that we can produce tanks in sizes up to 200 in diameter and 200 high, subject to design restrictions. 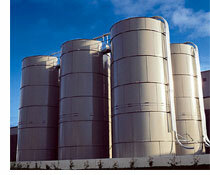 Our bolted silos are designed to meet the requirements of heavy usage. 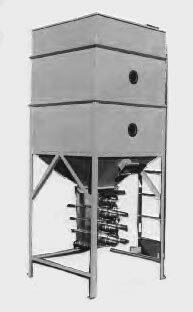 Hopper-bottom silos utilize a structurally designed hopper-to-sidewall connection that is reinforced at the hopper springline. Truck and rail drive-through skirt openings are reinforced with heavy wall square and rectangular tubing to increase stability. Welded silos are qualified to ASME Section IX. Shell seams are full penetration welded using sub-arc welding processes with copper backup. Other seams may e made with gas metal arc welding, flux-colored arc welding or submerged arc welding, as appropriate. 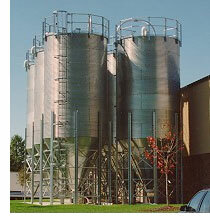 Standard welded tank diameters range from 8 to 14 and standard heights are 18 to 72. Welded silos are typically shipped as single piece units, ready to install upon arrival at the jobsite. However, when taller silos are desired, sections can be shipped for welding onsite. Skirted silos up to 12 in diameter and 80 long can be shipped on self unloading trailers for domestic deliveries. Corrugated silos are constructed of galvanized steel and range in capacity from 5,000 to 245,000 lbs., 6 ft. to 21 ft. in diameter. These silos require minimal maintenance and are highly resistant to weather conditions and industrial pollution. They help eliminate the possibility of costly production downtime due to interruption in material deliveries, because you're assured of a good reserve supply. Plant efficiency is increased because materials move from the bulk bins automatically to points of need with a minimum of operator involvement. 20 or 24 diameter combination manhole, pressure vacuum valve, (2 oz. pressure and 0.5 oz. vacuum). Recommended for use with filter.